From a security point of view, we do not have any intelligence on the matter," Assad was quoted by Lebanon's As-Safir newspaper as saying. "We cooperated with the investigators of the (UN) commission, but we do not have any pertinent information," Assad said of the panel created after Hariri's 2005 murder in a Beirut bombing that killed another 22 people. The attack was one of the worst acts of political violence to rock Lebanon since its 1975-1990 civil war and led to the withdrawal of Syrian troops after a 29-year deployment. The UN investigative commission has said there was converging evidence that Syrian and Lebanese intelligence services were involved in Hariri's killing, but Damascus has consistently denied any involvement in Hariri's assassination and the killing of other anti-Syrian politicians and figures since then. 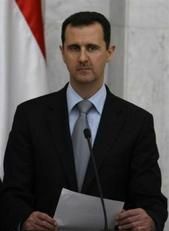 Noting that Syrian forces had pulled out of Lebanon shortly after the Hariri murder, Assad said "our relations with the Lebanese authorities were broken. There was no way to seek information or to investigate without cooperating with the Lebanese security services." The interview was published a day after Italian judge Antonio Cassese was elected to head the Special Tribunal for Lebanon, a special UN court set up to try suspects in a series of attacks in Lebanon, including the Hariri murder. The court, which has existed on paper since 2007, began work on March 1 near The Hague. In the months following the Hariri murder, Beirut arrested four Lebanese generals as suspects, and they are still in custody. Three civilians suspected of withholding information and misleading the ongoing probe were recently freed on bail. BEIRUT, March 25 (KUNA) -- Syrian President Bashar Al-Assad said the former presence of Syrian forces in Lebanon aimed to protect the country from division and civil war. In an interview with Al-Safeer Lebanese newspaper published Wednesday, Al-Assad said that Syrian forces were not in Lebanon to protect Lebanese figures or to preserve security. He said the assassination of former Lebanese Prime Minister Rafiq Al-Hariri targeted Syria, emphasizing the Damascus had no security information on the killing. He stressed that Damascus and Al-Hariri did not have conflicts on resistance, Arabism, or relations with Syria, saying that the international court on Lebanon was a Lebanese issue. The Syrian President highlighted that his country supported Lebanese President Michel Suleiman. He pointed out that Arab countries had the right to have different vision, stressing that it was not logical to be identical. He also said relations among Arab countries were changing to the better and that it was important to improve the Egyptian-Qatari ties. Meanwhile, Al-Assad noted that he supported the Palestinian reconciliation and said that Israel was not ready for real negotiations. The 2006 war between Israel and Lebanon changed the region and will have an impact on any peace negotiations in any state, he added.